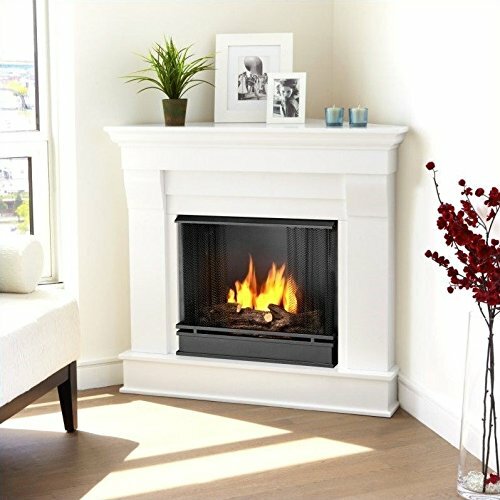 If you care about aesthetics just as much as you care about a heated living room, this convertible corner electric fireplace is the great deal. The heating zone houses an infrared technology that can heat even larger rooms (up to 1000 square feet) with relative ease, high thermal efficiency, and speed while ensuring the humidity is retained for a cozier warmth. The heated emitted, which can also be adjusted to get the best comfortable temperature for the weather, is evenly distributed to ensure every part of the room gets the same heat. The infrared firebox is then aesthetically surrounded by lifelike stacked stone to lend a natural look to your corner. The corner furniture features a transitional style with a rustic touch, espresso with Durango faux stone finish. 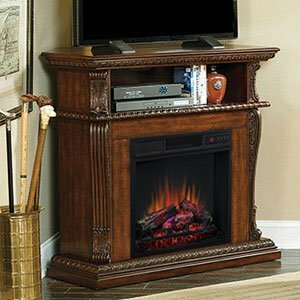 This corner electric fireplace offers much in terms of storage, with an open media shelf that can serve as the new home for your entertainment accessories, and LED lit cabinets to house your beautiful vases and treasured DVDs. The manufacturer had comfortability, convenience, and luxury in mind, which is why this furniture is equipped with the ability to remotely control the heat, logs, flames, and downlight. You can choose to turn off the fire and leave the heat on, or vice versa, and get to choose between 5 levels of LED flames. It features a 21-degree temperature range, 120v/1500 watt, 10,000 hours heating elements, and LED bulbs with an estimated 100,000 hours lifespan. You don’t have to worry about overheating, as there is an automatic shutoff in place. It also features a child safety lock and a cool non-heating glass front to make it one of the safest electric fireplaces out there. the overall look is appealing and will match any home décor. Oh! The beauty! This corner furniture is the perfect complement for your flat screen TV and electronics, you’ll be astonished with the display that greets your eyes every time you look at your TV set. This beauty is built from durable materials, which makes it a strong contender against the test of time even when it is holding up to a flat screen television up to 150 pound in weight and 50” in size. 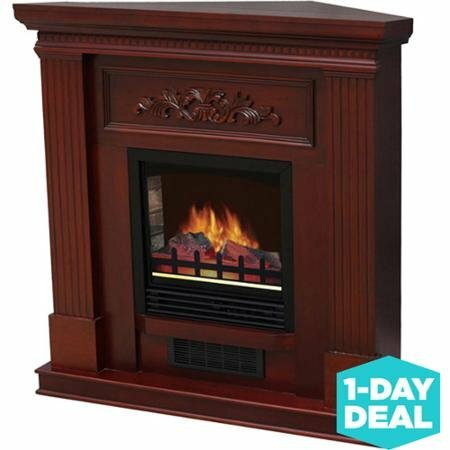 The corner electric fireplace is finished in a luxurious antique cherry, with an equally rich and elegant mantel. This magnificent finish will surely blend with any home décor, and steal the spotlight of your living room. In terms of storage capacity, it features front-flip center shelf and 2 side cabinets that offers you enough storage to house everything that is needed but needs to be kept out of view. The center of attraction is the powerful infrared heater that is more effective and efficient than traditional heaters, and most electrical fireplaces on the market, and can easily supply supplemental warmth for rooms up to 1000 sq. ft. The fire effect from the SpectraFire Flame technology is so realistic that even you, the owner, would get confused most times. You can choose to use each of the features individually or combined with others i.e. you can choose to heat your house without putting on the fire effect, or you can just decide to seat comfortably on your sofa, sip wine, and enjoy the beautiful scenery of the burning fire (without the heat of course!). A multi-function remote control ensures you doesn’t drop the glass of wine before adjusting any settings in this furniture. And amazingly, all these can be done without a single wire in view, thanks to the integrated wire management. The cherry finish is attractive and will blend with most home décor. 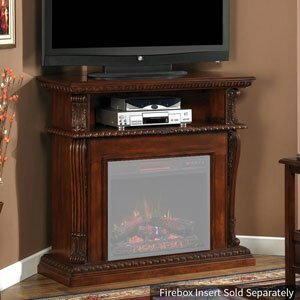 The Walker Edison Jackson Collection wood corner electric fireplace is a moderately sized corner furniture that doubles as a TV stand (a heat emitting one). The well-crafted piece of furniture can accommodate most TVs up to 50” conveniently. There is an open media shelf to house your DVD player or a satellite broadcast receiver set and two big shelves with tempered glass doors that can be used to store books, DVDs, flower vase, and anything that can fit in. 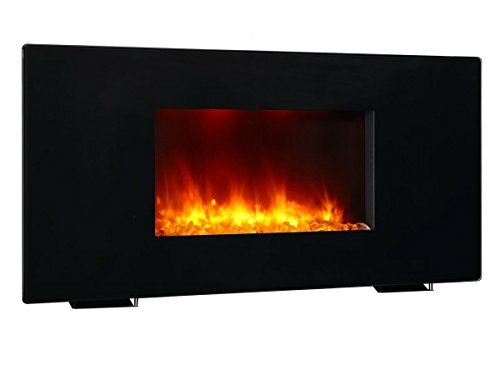 This beautiful corner electric fireplace is fabricated from high-grade MDF with a durable laminate finish, which makes it very durable and sturdy. The barnwood finish lends a traditional look you will surely fall in love with to your room, and complements the design of the room (It completely blends with the home décor). The realistic simulated burning fire creates the perfect scenery to create a really nice ambience in your living room. A good look at the review section of this product on Amazon confirms that the heater produces a great deal of heat. The unit is equipped with a thermostat that regulates the temperature level, keeping it in the healthy region. The only downsides of this beauty is the lack of remote control functionality. However, everything can be easily controlled manually. 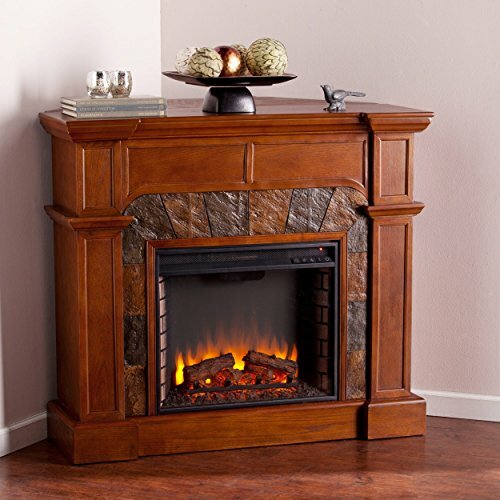 Overall, this is a great corner electric fireplace to consider for your living room, dining room, or parlor. 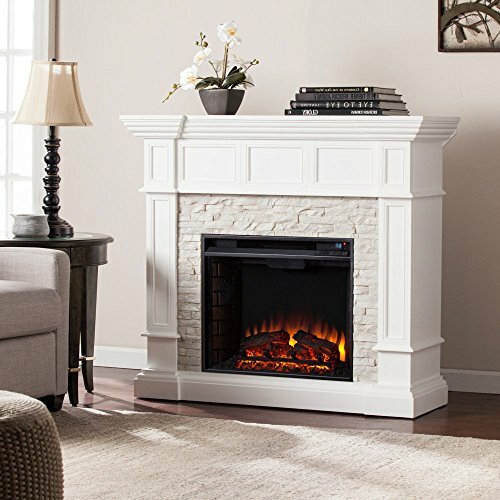 White is classical, and so is the white BOWERY HILL Corner Electric Fireplace. This adorable piece of furniture wore a rustic white faux stone finish that is really appealing to the look. 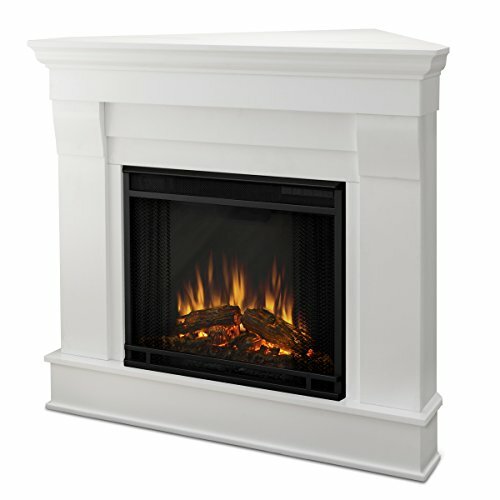 The firebox is wrapped in a lifelike white simulated stacked stone that complements the traditional look of your living room, dining room, or parlor. Well, it is quite amazing how this unique piece can transform your corner from a free, empty space into the center attraction of the room. The realistic lifelike flames and logs each have 5-level adjustment, or off, which can be remotely controlled at your comfort. The fire is lit by energy efficient LED bulbs, the cost effective wat to ignite bliss in any room without the need to break while installing. You can switch the heater on and go to sleep without the need to worry about how to switch it off, as there is an automatic shutoff technology that ensures the heat emitted remains safe and healthy. 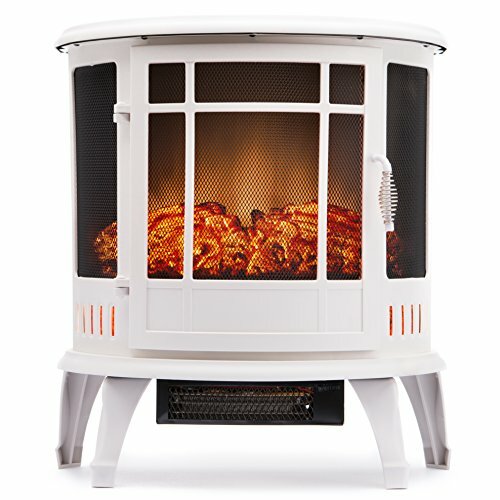 The fireplace is covered with a specially designed glass that remains cool to the touch, this simply means you don’t need to worry about your kids going near the fireplace or your clothes catching fire as you move around the furniture (No matter, be careful around fire – even if it is not real). The heater is capable of heating up to 400 sq. 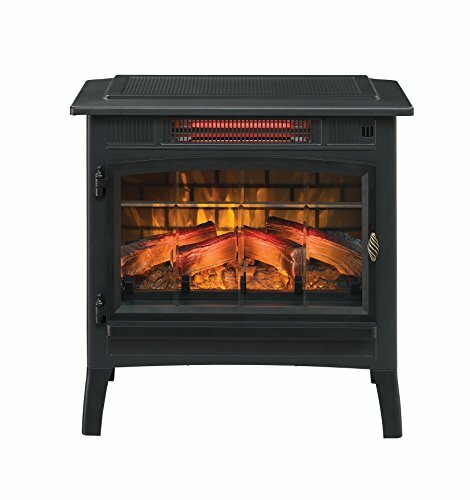 ft. maximum room size, the mantel is strong enough to support a weight of up to 85 pounds, and the corner converter supports up to 20 pounds. This white beauty will definitely blend with any home décor. The design is attractive and will fit in most home decoration. The furniture is made of quality material. The heating component can only heat a maximum of 400 sq. ft. size, which is relative low for large apartments. Do not underrate this beautiful corner electric fireplace just because of its simple appearance, it packs more technology than most products in its category. 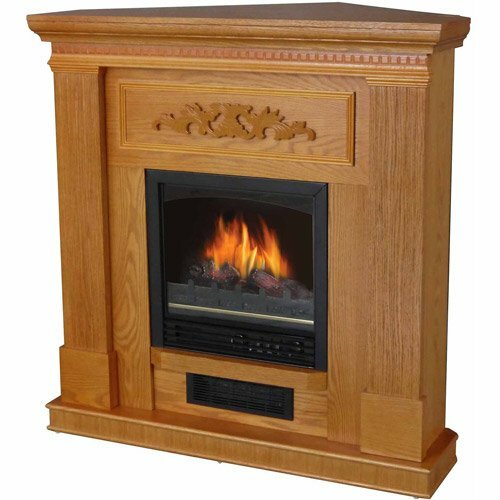 The Real flame electric fireplace not only blends with most home decorations, it simply steals the spotlight with its beautiful, professionally-done oak finish. For ergonomics reason (which is the way how things we use affects our health), the height of this corner furniture is set at 33 inches, which puts the television at a strain-free, comfortable viewing level while a thoughtfully engineered trim adds interest and detail to your view. 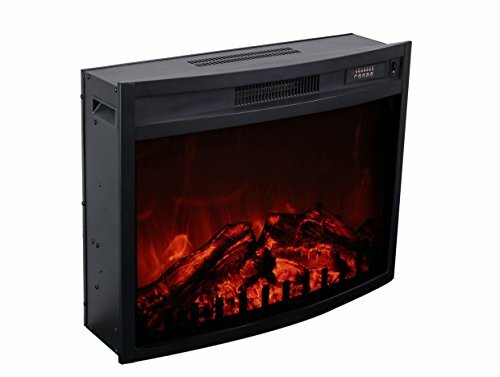 This corner electric fireplace fits up to a 50” TV and supports a weight of up to 100 pounds. You get enough storage to house almost all your electronics. There is an open cabinet to store your DVD player, decoders and the remote controllers. There are 2 open shelves on both sides of the furniture to house your books, DVDs, photo frames, and flower vase. The fireplace is adorned with Real flame’s patented flame technology which creates one of the most realistic electric fireplaces available in the market, with a digital readout display. We mentioned that this furniture packs good technology, and that wasn’t a bluff. Apart from the standard remote control that comes with most products, there is a programmable thermostat technology to regulate the temperature, a timer function to set heating intervals, a brightness setting (to control brightness of course), and an ultra-bright LED technology. Though not technology related, you also get 90-day limited warranty on mantel and 1-year limited warranty on electric firebox. The warranty policy is good. Corner electric fireplaces are relatively new. Electric fireplaces became popular in the 1950s and since then, they haven't lost their effect, personality, uniqueness, beauty or popularity. From the youngest to the oldest, everyone loves to watch the relaxing fire burning in their houses, bringing warmth or sometimes only light to their living room. If you are one who enjoys such a view, then a fireplace would definitely fit in your living room and will enchant you every night. Do you dream of having such a beautiful piece in your own home? Well, it is a permanently modern piece, so you should never worry about buying it. It will always be magical and perfect! Anyway, if the atmosphere and design of your living room is very modern and exquisite, than you might prefer a more modern variant than the classic fireplace. Therefore, electric fireplaces come in all sorts of new, modern colors, with color-plays and relaxing sounds and while they are very realistic, they keep offering, at the same time, that sensation of new and authentic. Also, due to the fact that they don't require wood or gas maintenance, electric fireplaces are not only modern, but also safer and more economical, which makes them a great investment if you have kids or if you simply wish to have your dream living room with a fireplace but also wish to cut off the gas bill. 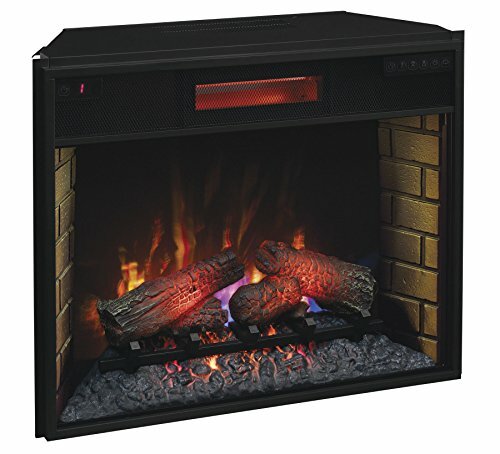 26″ Insert electric fireplace, 3D flame technology, requires no gas, no oil. No smoke, No ashes. 750W/1500W, 5,100 BTU’s. Flame effect can be operated with or without heat, all year use. Realistic Carbon log fuel effect with adjustable Flame brightness, add ambiance to your room. Accommodates most flat screen TVs up to 47″ or up to 50 lbs. DESIGN: Stunning classical design with ultra-realistic flame and mesh doors. Compact design great for all indoor spaces including corners. FUNCTIONALITY: Supplemental heat for up to 400 sq. ft.; Operates with and without heat. 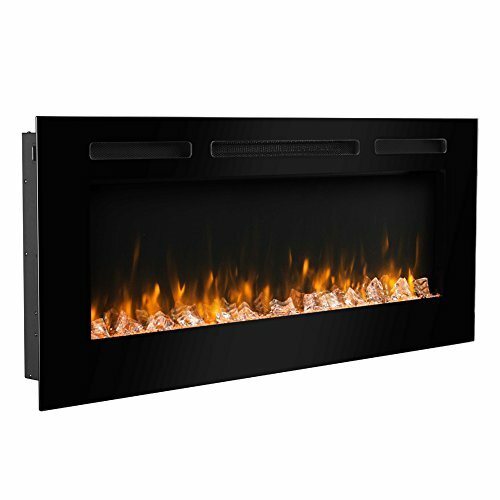 DESIGNED FOR IN-WALL INSTALLATION: This electric fireplace is specially created for recessed mounting in walls. Its black frame gives a room a sleek, modern look. This versatile fireplace also adds a cozy touch to a living room, bedroom, or office. The 50-inch fireplace comes with easy-to-follow instructions to help homeowners install the unit on their own. TWO HEAT SETTINGS: Perfect for the cold seasons, the Touchstone Sideline features two heat settings: high and low. Heat vents are located on the upper front area. The heat level can be adjusted according to the user’s preference, making this fireplace a functional and practical fixture. The fireplace can be turned all the way up in freezing weather to keep you snug and toasty. For slightly chilly weather, it can be set on low to provide ample warmth without being too hot. Like a lot of furnishings and pieces of home decor, the fireplace has undergone a lot of changes over the years. 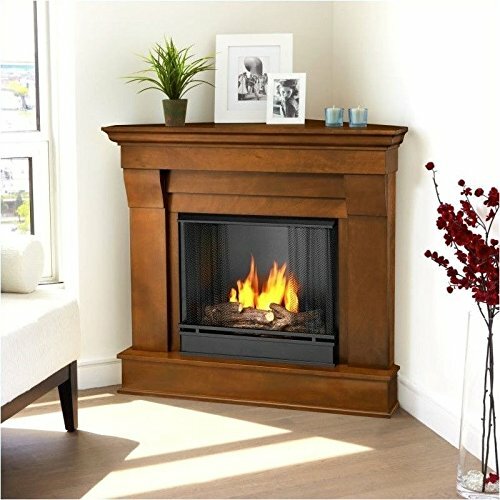 The corner electric fireplace is one of the finest and most convenient ways to experience both the beauty and the warmth of a fireplace in your home. 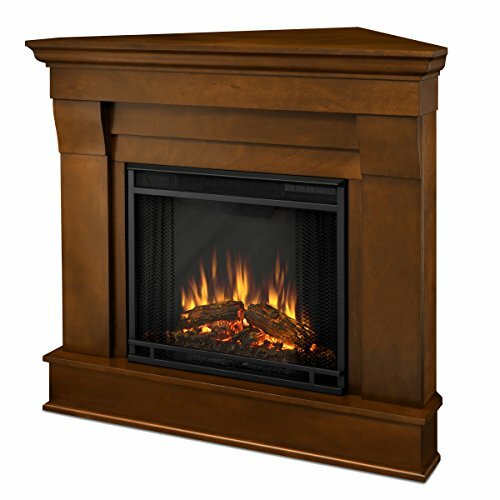 The corner electric fireplace offers several advantages over more traditional fireplaces. These arise both from its conscious design to fit snugly in the corner of a room and the convenience of their electric design. Of course, the roots of the corner electric fireplace come from the age old design of fireplaces themselves. That means there’s something for everyone in these pieces that blend the best of tradition with the best of innovation. This blend also gives corner electric fireplaces an almost chameleon like quality to adapt to any room and any sense of individual style. This article seeks to explore several key corner electric fireplace ideas and demonstrate how to experience their beauty in any home. First, let’s explore the unique advantages that this type of design offers homeowners. 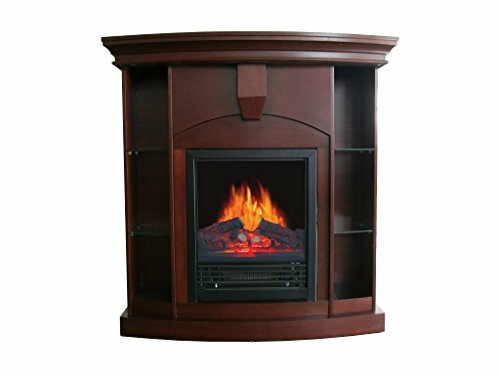 There are several major advantages provided by the corner electric fireplace. A lot of these have to do with its construction and design. While corner electric fireplaces vary a lot and can come in many different forms, such as the corner electric fireplace media stand and even mini corner electric fireplaces, they all also have many design elements in common. actually do. Even if you have a very large corner fireplace, its positionality means that there is still plenty of usable space in the room. Also, because they are available in such a wide variety of sizes, shapes, and configurations, electric fireplaces for the corner of a room can also be integrated into the other functions of a room. 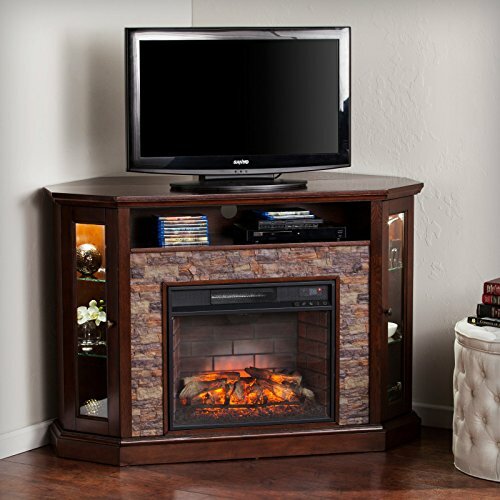 And showing its versatility, the corner fireplace with TV stand is also very popular. Some common examples of this include bookcase corner electric fireplaces, as well as the aforementioned entertainment and media center models. These allow you to store and proudly, beautifully display a library of books or films, or to watch television and consume other media. Additionally, corner electric fireplaces have the advantage of being able to work in almost any space because of the way they blend tradition and innovation. While a fireplace can often add a rustic or traditional feel to a room, the modernist look of the corner shape and the efficiency of an electric fireplace can balance that out with a more contemporary feel--meaning that the corner electric fireplace is equally at home in a streamlined office, a cozy cabin, and an exciting media room. If too traditional or too modern doesn’t sound like your cup of tea, keep in mind that there is a wide variety of corner electric fireplace designs, some leaning more heavily one way or the other, while others sit comfortable in the middle. Of course, one of the other major advantages of the corner electric fireplace is its simplicity and consistency when compared with a wood burning fireplace. Wood burning corner fireplaces are not as common as corner electric fireplaces because of the amount of space and air flow that a traditional wood burning fireplace needs to function. However, they do exist. While wood burning fireplaces can often emphasize that traditionality and rustic aesthetic a great deal, there are plenty of electric fireplaces that do the same thing without the hassle of a wood burning fireplace. Conventional fireplaces that burn wood are much harder to install and maintain than corner electric fireplaces, as they need either an entire chimney or at the very least a complex ventilation system in order to be operated safely. However, what attracts most electric fireplace users is the simplicity of their operation. With electric fireplaces, there is no need to buy or cut fuel, and getting the “fire” started is often as simple as pushing a button. Of course, electric corner fireplaces also have a major advantage over conventional electric heaters in that they look more beautiful and can be more easily integrated into the decor of a room. That’s what the corner electric fireplace is all about: taking the best aspects of fireplaces and modern heaters, while leaving out the hassle and difficulty associated with both. There is another exciting innovation in the world of corner electric fireplaces that’s even newer and more impressive in many ways: the portable corner electric fireplace. These electric fireplace heaters for the corner are perfect for moving around the house for space heat, or even taking along on a cabin trip. While lighter and easier to move than many corner electric fireplaces, they provide the same heat and beauty, and are just as simple to use. As the technology behind corner electric fireplaces continues to improve, it’s likely that they will become ever more portable as time goes on. 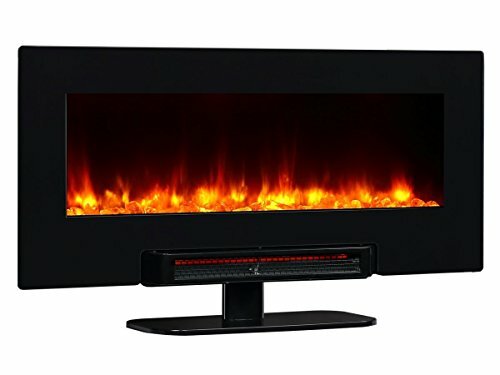 Of course, it’s also worth considering that even full sized corner electric fireplaces are often more portable than other types of heaters, and obviously a great deal more portable than an in-wall fireplace. The freedom to move around without difficulty and the ability to work in almost any space regardless of size, use, or decor are two of the major things that make these fireplaces so special. There are a wide variety of ways to install a corner electric fireplace, and it is important to both get the model that suits your prefered installation style and follow all manufacturer’s instructions closely and carefully during the installation process. Many electric fireplaces fit into existing fireplaces. Many more are free standing. These include many of the types that are integrated with other furnishings like media stands, bookcases, and more. Still others include a cabinet like the frame of a conventional in-wall fireplace--and if you’re handy, you can even build one of these yourself! Of course, it’s also important to take all the proper precautions and make sure the electric fireplace is properly ventilated. Additionally, a big part of the installation process for a corner electric fireplace actually happens after it’s settled into its place and plugged in. Decorating a home is all about expressing your own personality and sense of style. One of the real beauties of the corner electric fireplace is how easy it is to make one completely your own. Whether you incorporate your corner electric fireplace into your working life in a home office, perhaps using it as a space to display a computer monitor, or you go with the age old tradition of putting photographs and display objects on the corner mantle, the possibilities are truly endless. 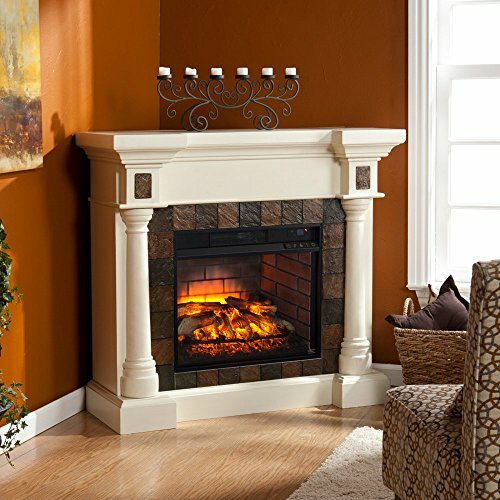 Defining your corner electric fireplace can be a major part of defining your space and yourself. Between all of the advantages in terms of ease of use, ease of installation, and safety, it’s easy to see why so many homeowners have chosen to integrate corner electric fireplaces into their decorating and furnishing strategies. However, it’s really the beauty and variety of these pieces of furniture that makes them stand out from the crowd. Their versatility is also impressive, especially in the way that they can work so well in virtually any living space. Last but not least, it’s the almost blank slate quality that many electric fireplaces for the corner have: their ability to adapt to your taste and style. This all comes from their hallmark blend of tradition and innovation. While plenty of other furnishings harken back to a time long gone by or look only to the future, the corner electric fireplace is both a deep evolution in the way that fireplaces fit in the home and a continuation of a grand history.